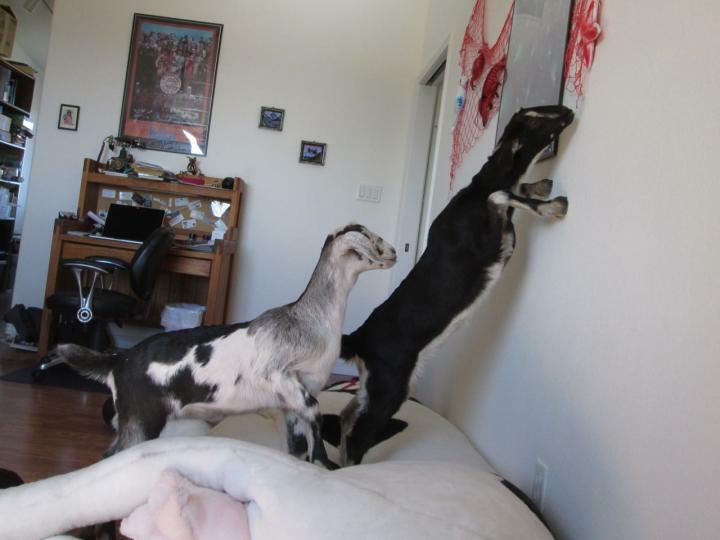 We’re still having fun letting these kids be “inside goats” from time to time. 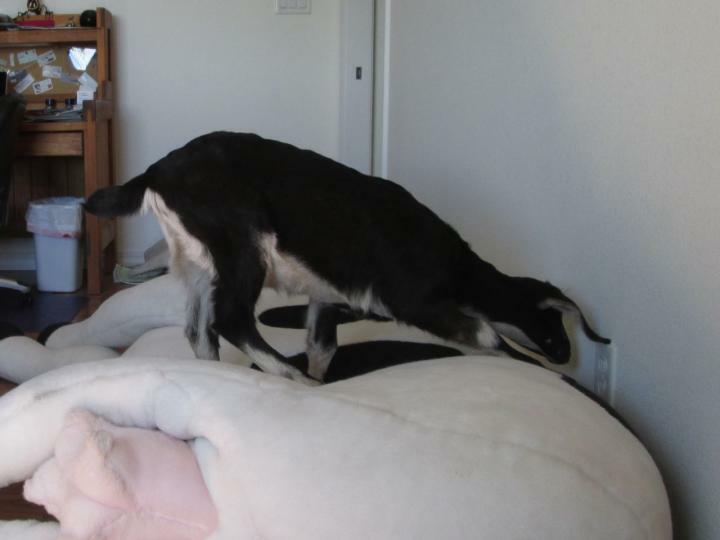 They love prancing around and “skating” on the hard, slippery Pergo floor in the office, and they love bouncing on our various soft surfaces like couches and carpets. Skeeter’s never seen an udder this big! Is there milk in there? Blackbird investigates a somewhat riskier outlet. Then pell-mell to the bottom! Last November I went to visit family for Thanksgiving and my mom, my aunt Jana, and I spent an afternoon poking around in some antique stores in Granbury, Texas. Jana was the one who spotted an incredible treasure. 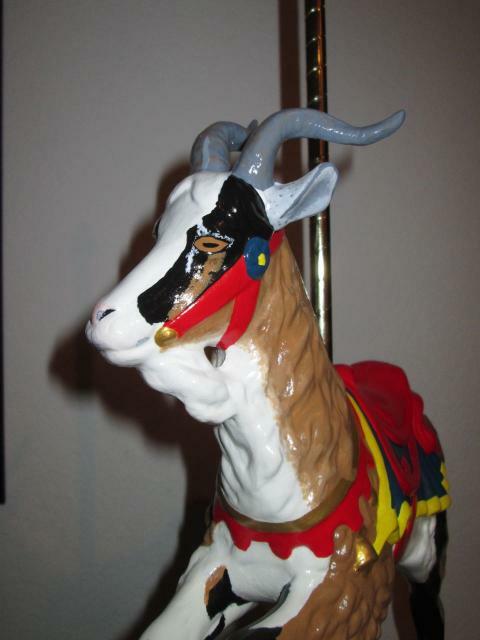 It was a plaster carousel GOAT! My heart leaped. I knew Phil would love it. But surely it would be much too expensive. 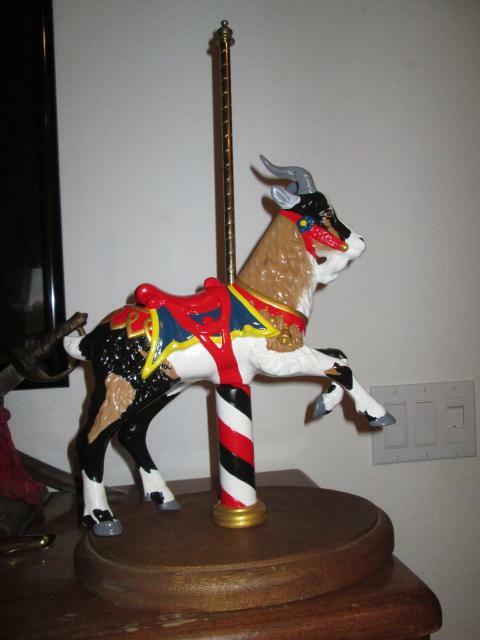 Carousel horses–even small ones–are very collectible and often very expensive. 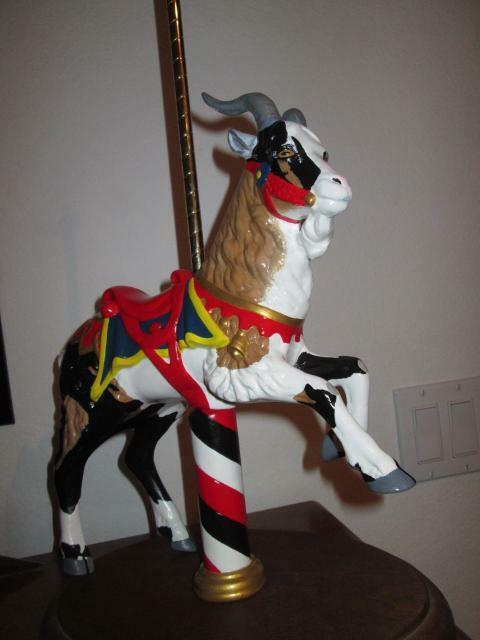 A carousel goat had to be rare and I thought I would see a $100 price tag. But no, it was only $30. I had to have it! But as unique as it was, it was also kind of ugly. It was dull gray with a very ugly tannish saddle with purple saddle blanket trimmed in red. The bridle was mint green and the harness was dark green with mint trim. The pole was red, white, and mint green stripes. On closer inspection the paint was stained with what looked like old yellow cigarette smoke and was beginning to flake in areas. But it was unique and I knew I could fix it up. I’m kicking myself now that I didn’t take photos of what it looked like when I bought it, but I didn’t expect the results to be so incredible. I spent a LOT of time carefully peeling, scraping, picking, and sanding the old paint off. 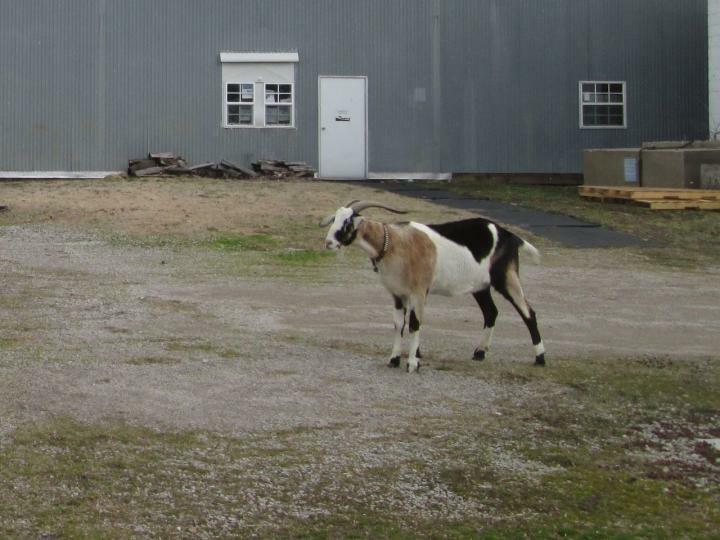 I discovered that one horn and one hind leg had been broken and repaired at some point in the goat’s history. 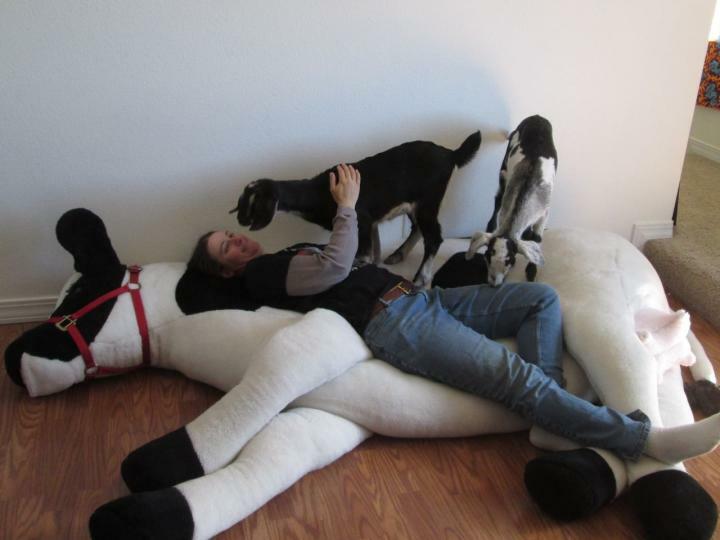 I had to re-repair the hind leg because it came loose while I was scraping the paint off it. Once I got it down to the plaster I sprayed it with a white primer and had a beautiful blank canvas to work with. 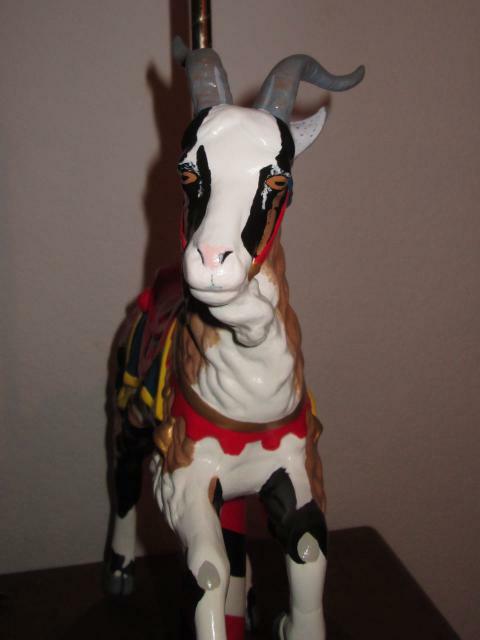 I was originally going to give this goat to Phil for Christmas, but because of the time involved I pushed it back to his birthday in February. Well, when his birthday came round I was only partially done with the paint job. It took me another week to get it completely finished, and it wasn’t until just this week–more than a month after his birthday–that I was finally able to get ahold of some glossy lacquer to finish the job and give it a fine porcelain look. 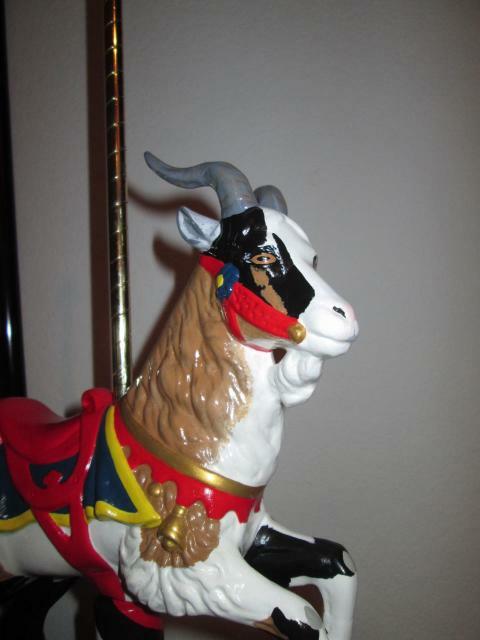 And here it is… a portrait of Huckleberry Finn as a prancing carousel goat! I wish the photos could do it justice because I think it came out rather fine. I especially enjoyed painting the detail around the eyes and ears. 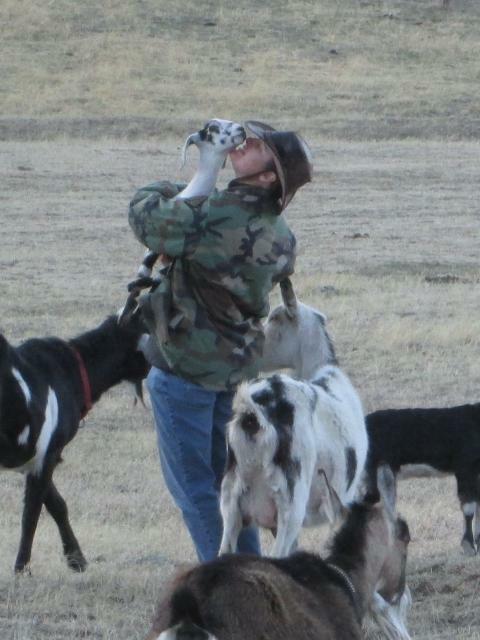 The little speckles were a lot of fun. 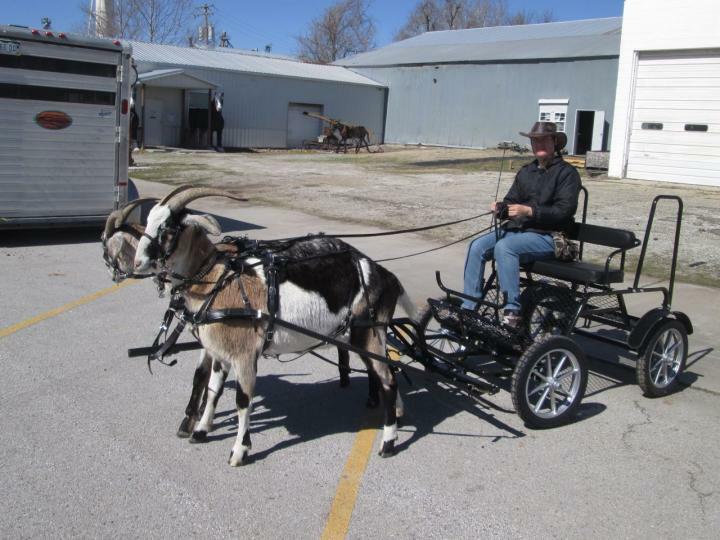 Today is my birthday so I told Phil I wanted to take the goats for a drive in our new carriage after he got off work. They were very good boys–much better than last week. I think they were just a little rusty last time. Finn had a better attitude today, they worked together better, and there was much less pulling at the bits. We even went up and down a couple of hills and it didn’t faze them at all. 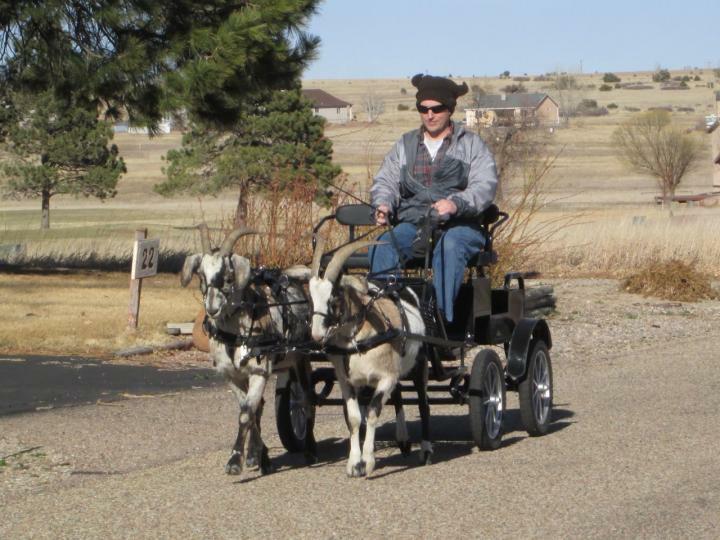 Phil got out once or twice to take some pictures, but for most of our hour-long drive he rode in the wagon with me. So here are some photos to make you all jealous. Neener-neener-neener! Phil and I got out before we reached the truck and led the boys the rest of the way. I try to make sure we always disembark someplace besides the truck so it’s not quite such an attractive nuisance. We brought Skeeter and Blackbird into the house yesterday for some play time. They liked the “cowch”. The last light at yesterday’s walk was amazing. 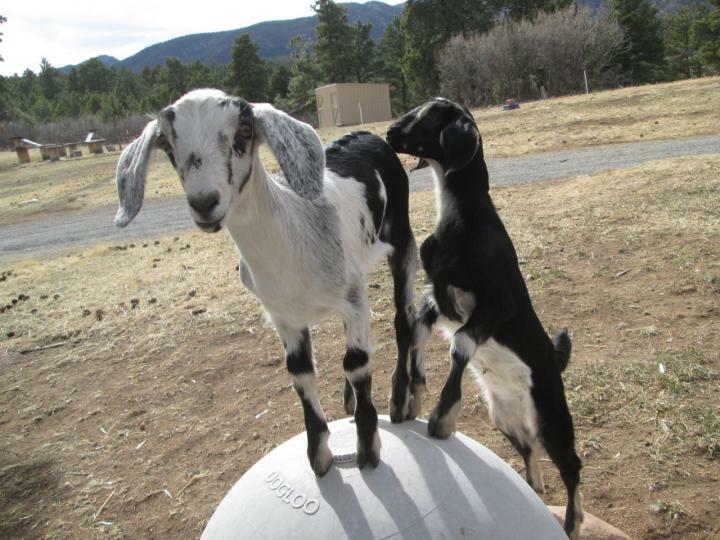 The baby goats entertained us as usual. I can never feel unpopular or unloved around here. 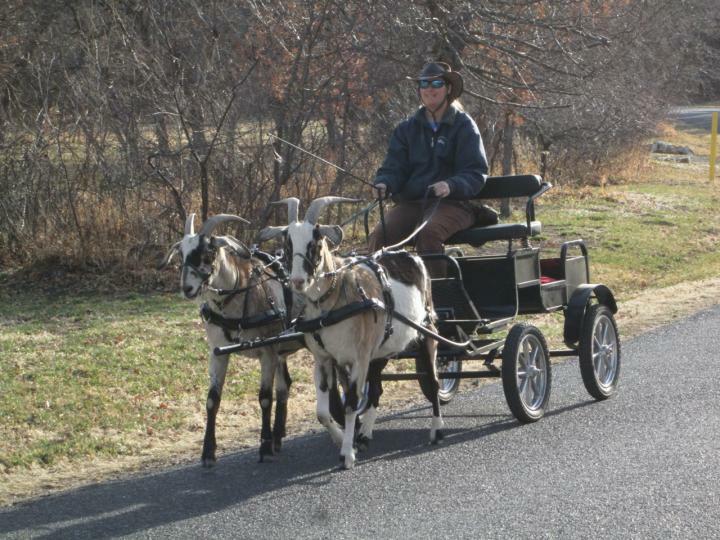 We finally had a chance to take the new wagon out for a spin yesterday and it was a blazing success! The boys haven’t been driven much since last summer, so they were a bit fired up. They had no trouble at all pulling Phil and I together in the carriage, and in fact we had to spend quite a lot of the time holding them back. This new carriage really fits their size and it looks very dashing. I left the back seat off for now so we can use it like a buckboard and carry cargo. The rear seat is conveniently easy to install and remove. It’s has brakes to help the boys on stops and downhill pulls, and the tongue is self-supporting so the boys don’t have to hold it up by the breastcollars. 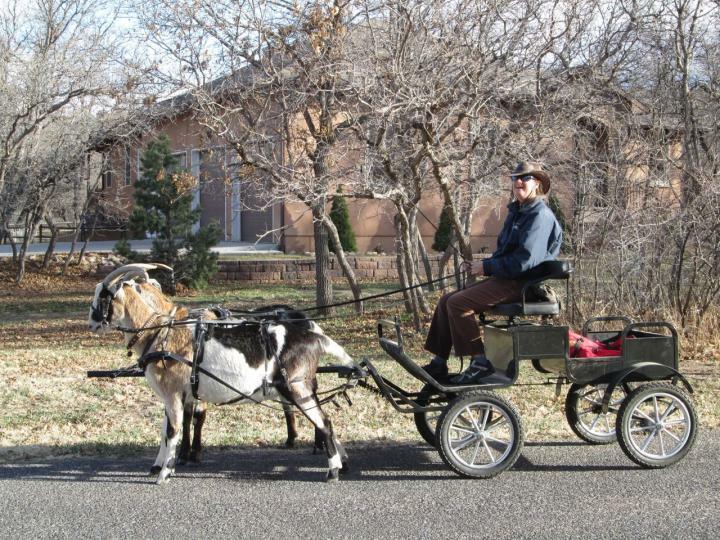 It has a cushy suspension so it’s a very smooth, comfortable ride for Phil and I too. I think we’re going to have a lot of fun with this vehicle! I took these photos last week before Tigerlily’s recent tragedy. 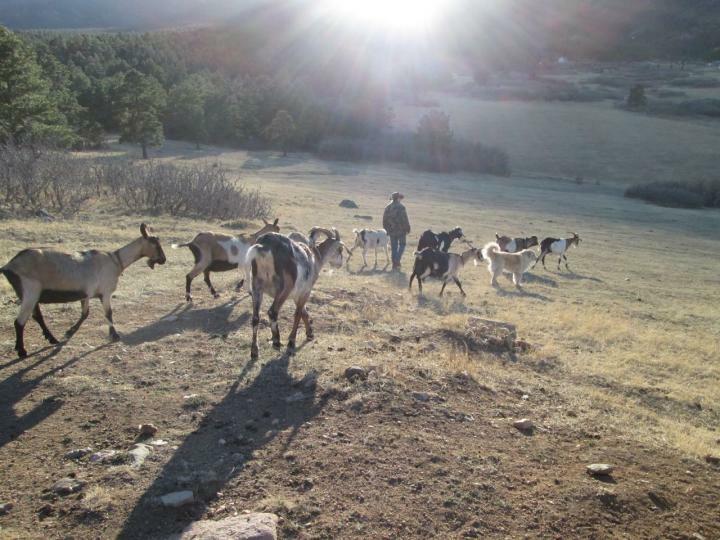 Everyone stampeded from the pasture when we called them for their daily walk. Gotta love Blackbird’s flying ears and tail! Tired Petunia is all the way at the back. 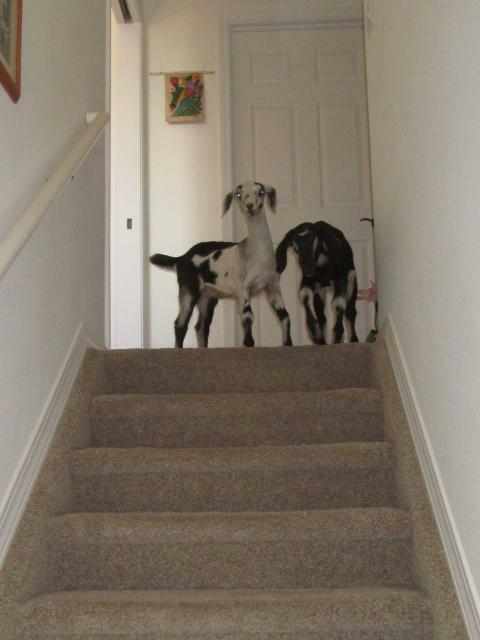 It a lot of work raising two rambunctious rapscallions! 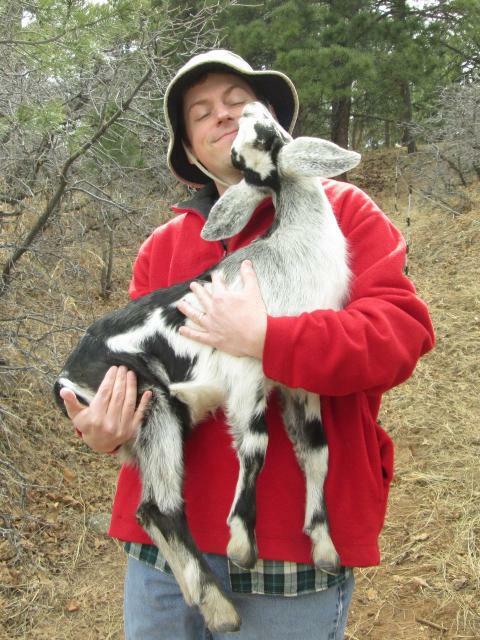 Skeeter loves to jump up for cuddles. “Up! Up!” she says. Blackbird is quite the armful these days. She’s a little more wiggly, but she’s still as sweet as ever. 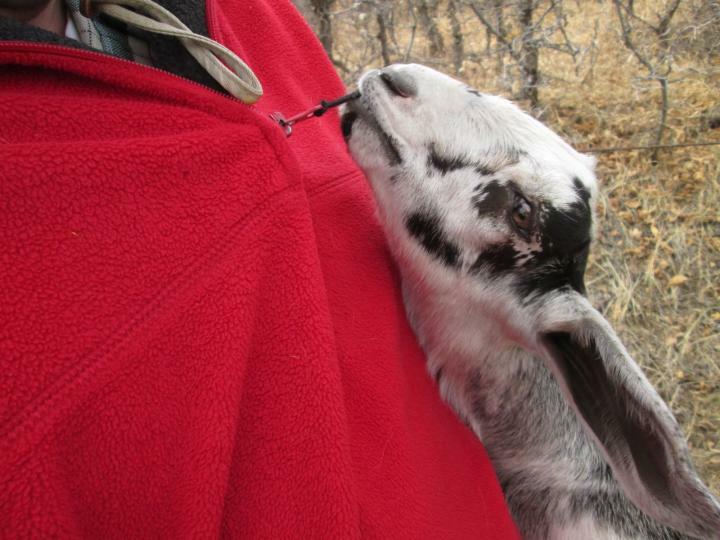 Skeeter loves to chew on clothes, hats, strings, zipper pulls, etc. (Luckily not hair.) We’re going to have to start working on that. Innocent curiosity is one thing. Destructiveness and demands for attention are quite another! 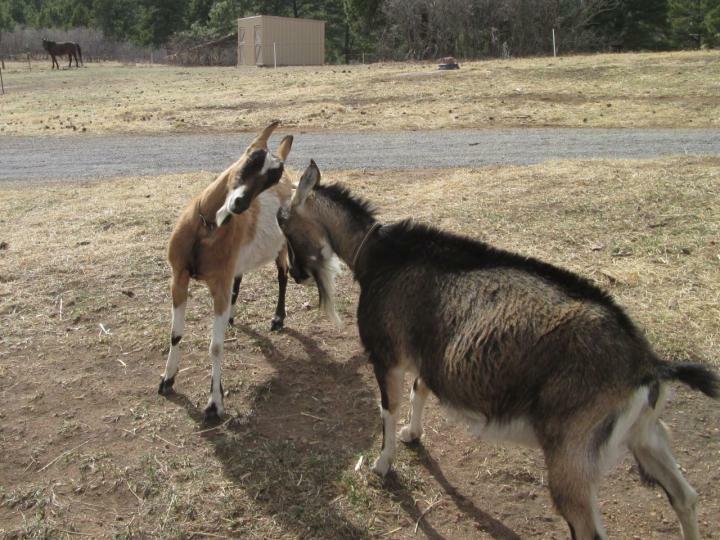 Tincup and Jezebel engage in a little friendly head-butting. 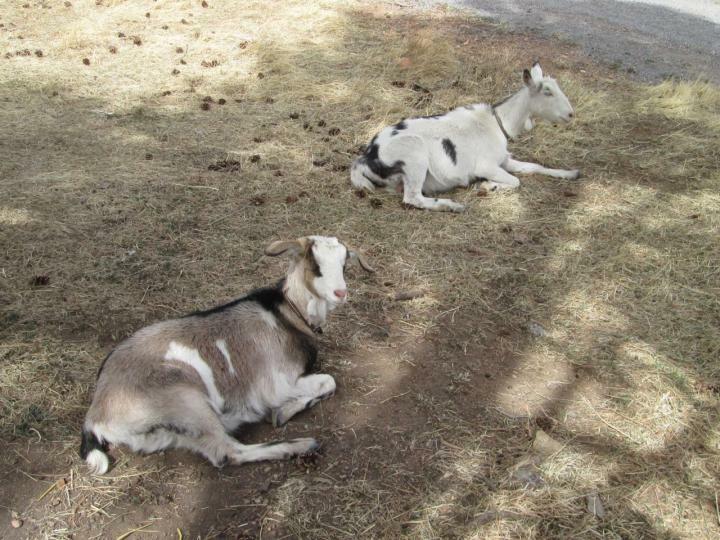 Coral and Tigerlily prefer to take it easy and relax in the shade. I love Blackbird’s face here. 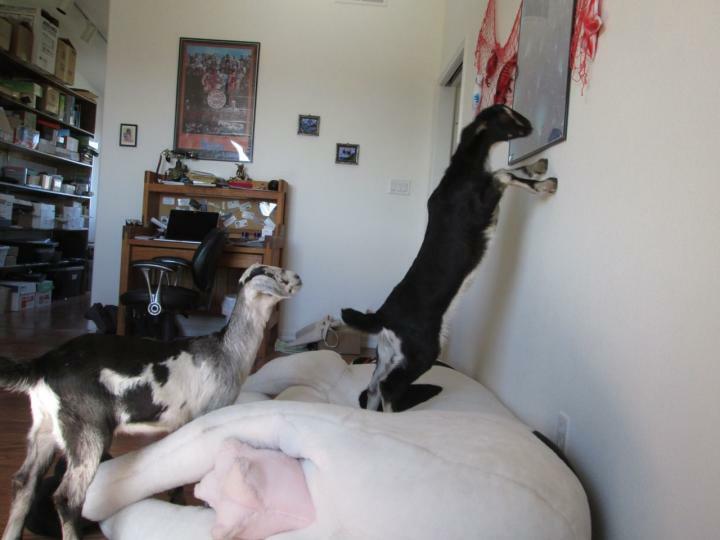 She was enthralled by Petunia’s fluttering tail. I think mama is tired! We’ve really been looking forward to Tigerlily’s kid(s) this year, but unfortunately it’s not to be. 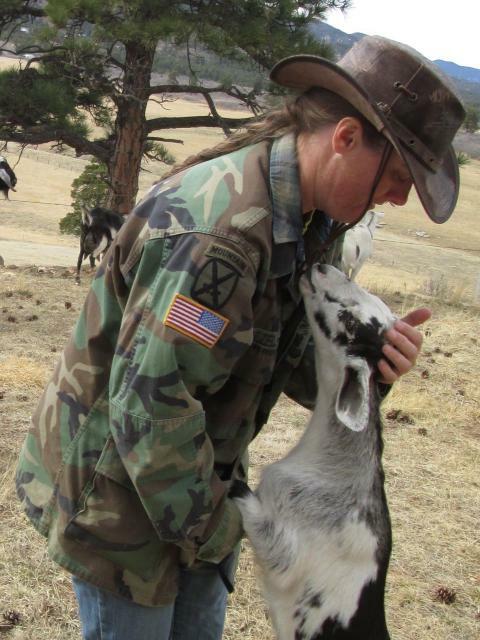 She miscarried on Sunday and passed a single buckling on Tuesday morning. She was a month early. I’m not sure what to do with this gal. 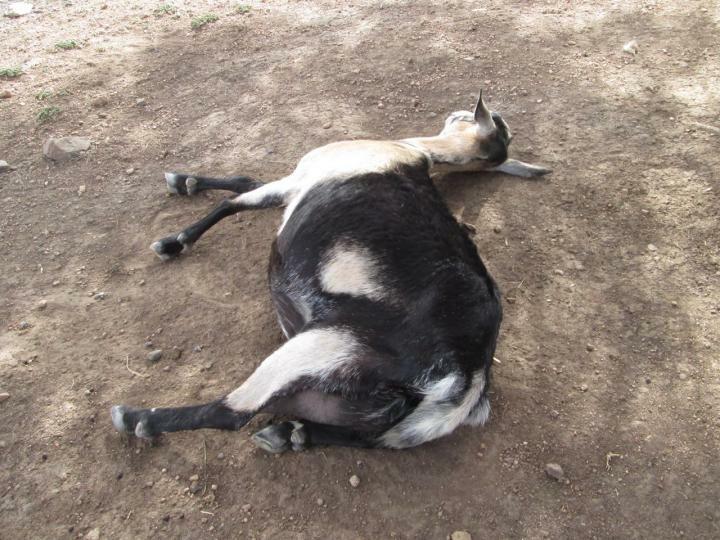 I think she’d been fighting too much with the other goats. 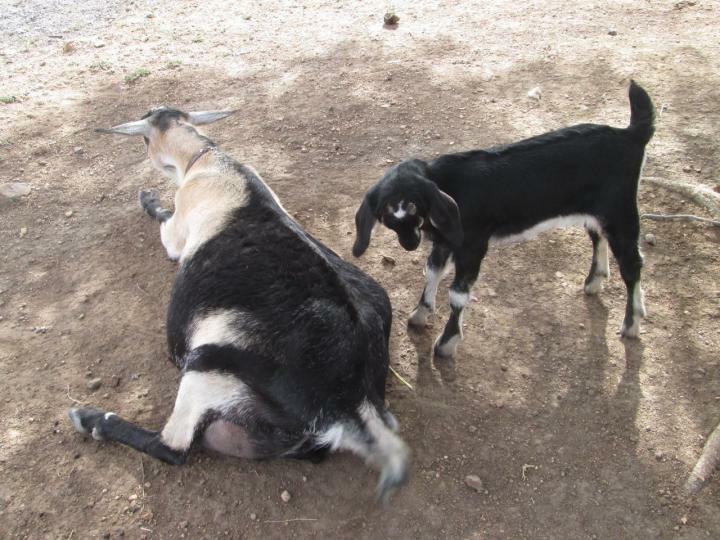 They weren’t picking on her–she was deliberately provoking goats higher in the pecking order and kept getting whacked, so I have secretly been a little worried about her pregnancy. It’s disappointing, but she seems to be fine and isn’t mourning or acting “off” so I think all should be well. 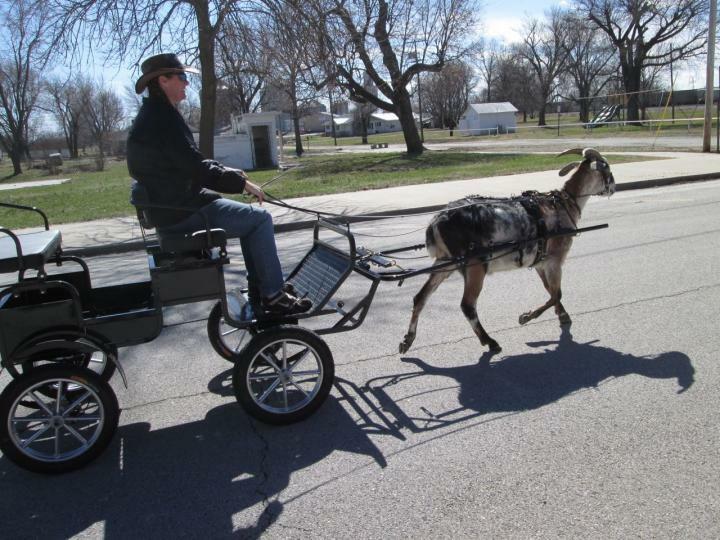 I’ll have to train her to pull a cart this summer so she has a job. She’s big, strong, athletic, and flashy so she needs to do more than just eat all summer. 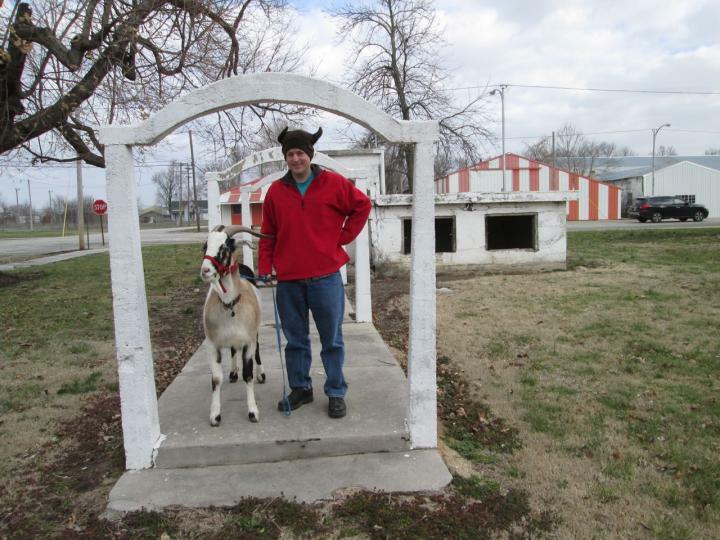 Phil and I had fun this past weekend on a whirlwind trip to Kansas City and back. Phil has been collecting marbles since the first year we got married and on our goat vacation last fall we stopped in Bonner Springs, KS and visited the Moon Marble Company. It was a fascinating stop and we found out about a marble show they were hosting in March. We decided to take a peek. 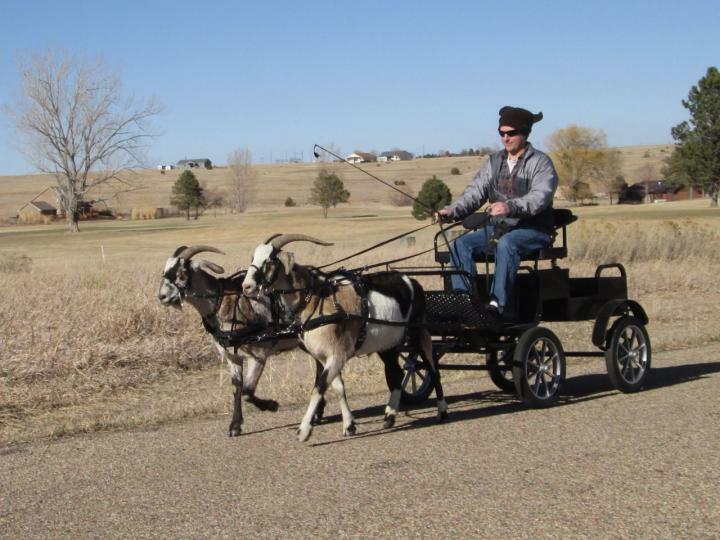 Meanwhile, I’d had my eye on some miniature horse carriages at Frontier Equestrian in Jasper, MO–about two hours south of Kansas City. 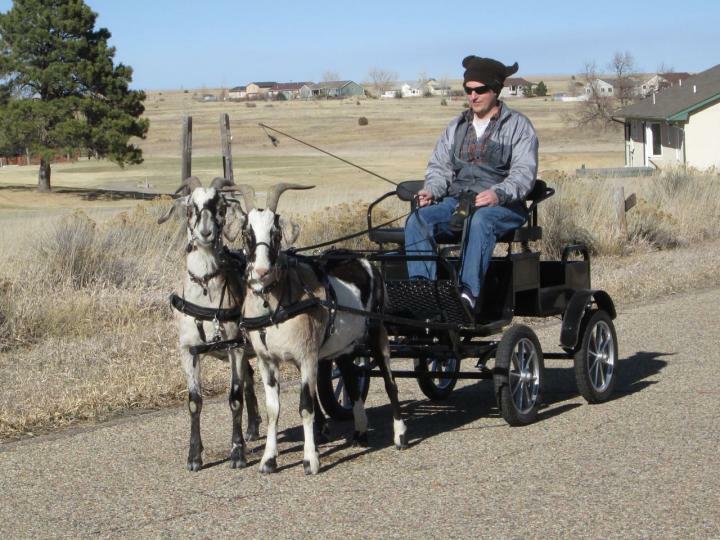 I thought if we brought Finn and Sputnik we could hit up the carriage shop after the marble show and test drive a few wagons. 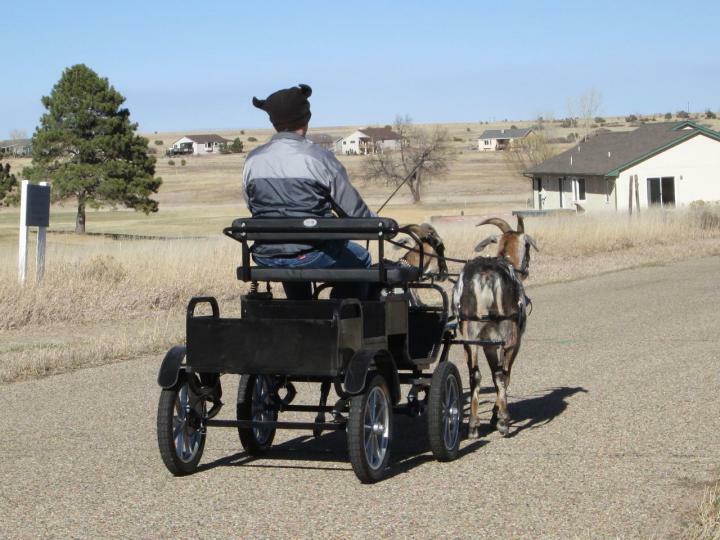 The little garden cart was perfect for training, but it’s woefully small for such big goats and it only fits one rider at a time. 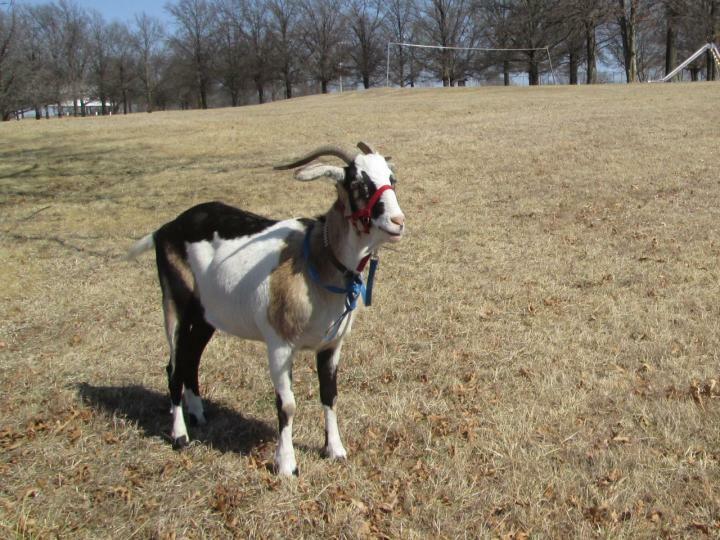 While Phil entertained himself at the marble show, I took the boys out to a local park and spent the day hiking around. It was not a very interesting park, but it was quiet so we got in a lot of off-leash walking. There were playgrounds scattered all over the park, and Sputnik and I amused ourselves by jumping through the swings. 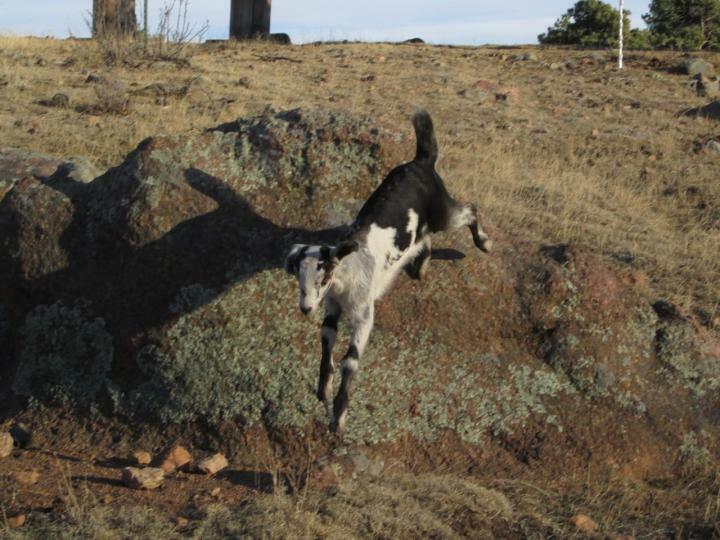 If I point Sputnik at a jump, he flies over it. 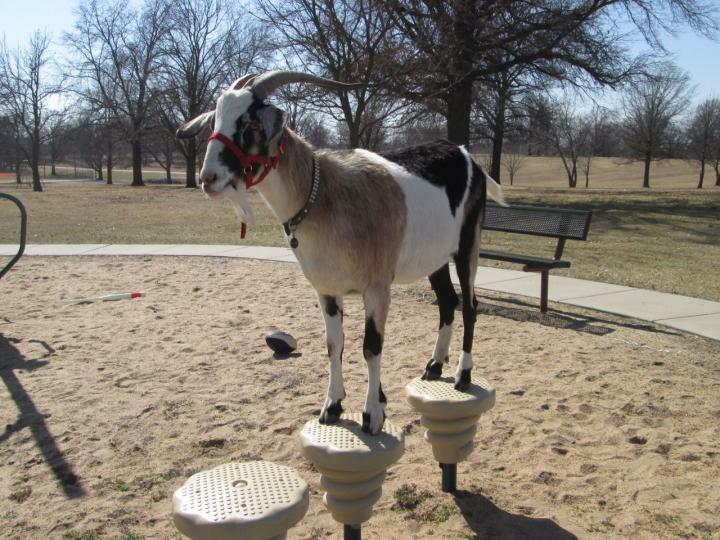 He also leaped over park benches (without stepping on the seat), barriers, and a tall, narrow bouncy horse. 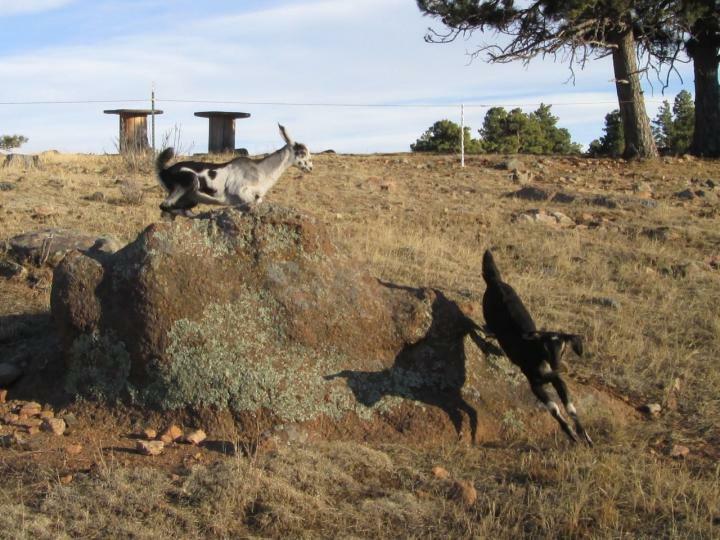 Finn is a far more talented jumper than Sputnik, but he generally preferred not to try. I think he was sulking a bit without Phil there. Finn acted terrified of the swings and it took me a little time to convince him to leap through them. Eventually he got the hang of it, but he showed no enthusiasm for this “pointless” activity so I didn’t make him do much. Meanwhile Sputnik was begging for more. He likes pointless activities if they involve cookies! This pointless activity, on the other hand, amused Finn to no end. 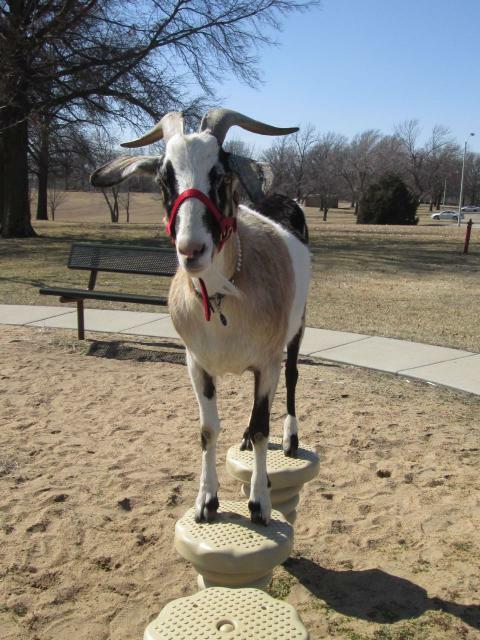 We found a set of elevated “stepping stones” on springs. Finn made a beeline for them and didn’t want to get down. He stood on one and spun circles, walked across all three, turned around, and walked back. Sputnik walked over them too but was less enthusiastic, especially since Finn kept knocking him down to take his place. I had to tie Finn out of the way so Sputnik could even try. Sputnik was standing on a park bench with Finn in front of him and I was hoping to get a photo that made it look like Sputnik was standing on Finn’s back, but it didn’t quite work out that way. 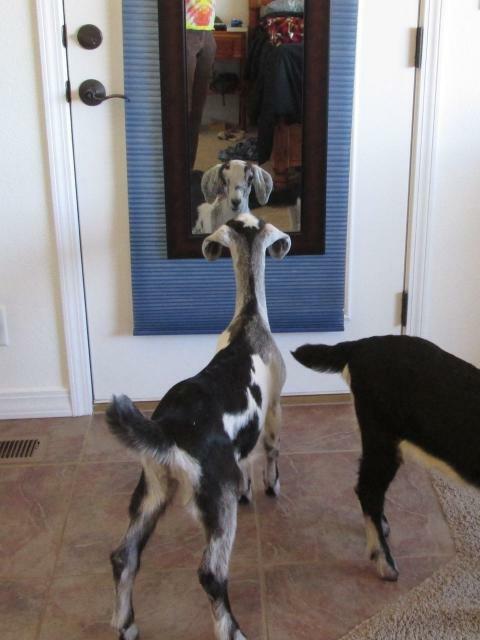 My goats are too tall! The marble show lasted two days, and on the second day I took the boys walking on the Indian Creek trailway that runs for over 20 miles around Kansas City. We only explored part of it of course. 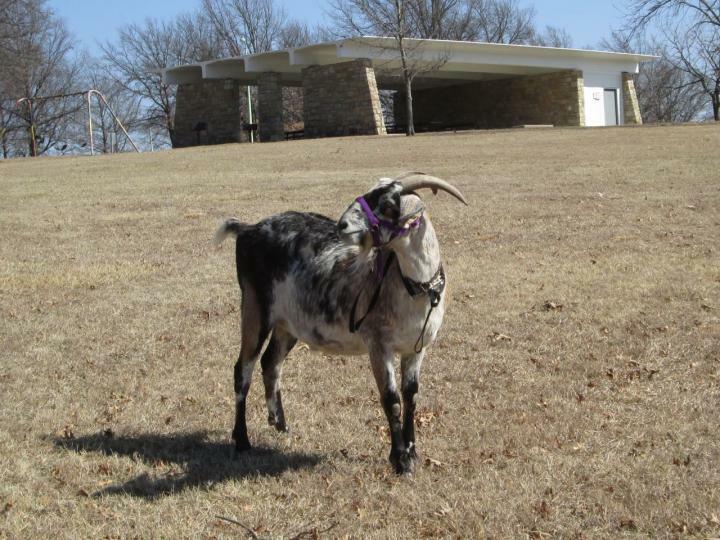 There were more people there than at the park so I spent more time stopping to explain why I had goats parading around the city on leashes. 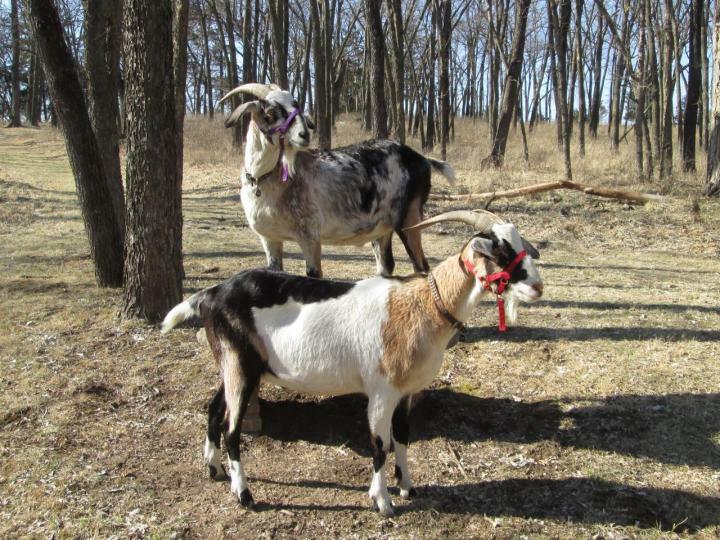 Finn and Sputnik were very well-mannered for all of it so it was quite a pleasant day. Thinking back, a walk like this would have been miserable just two years ago. I’d have had a terrible time trying to control both of them by myself, and I’d have had to deal with balking, spooking, bolting, fighting, and trying to go back. Our boys have come a long way in their training. 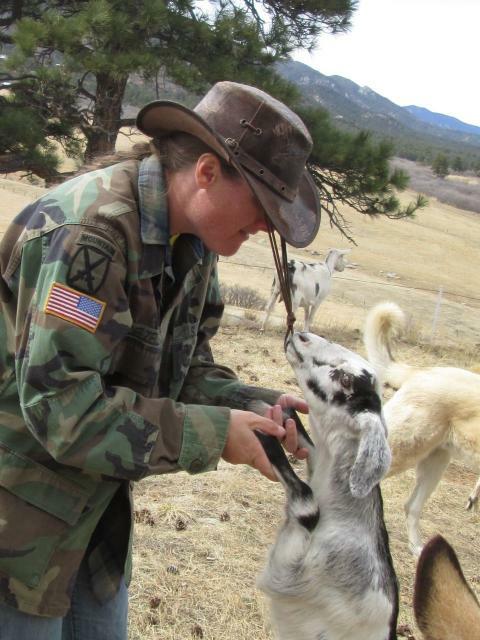 They walk nicely beside me so I can hold a leash in each hand without fussing. They obey voice commands very well, so if one needs to speed up or slow down I can control him with a word and a slight tug on the leash. They don’t balk or spook at dogs, bikes, baby strollers, sirens, or blowing trash. 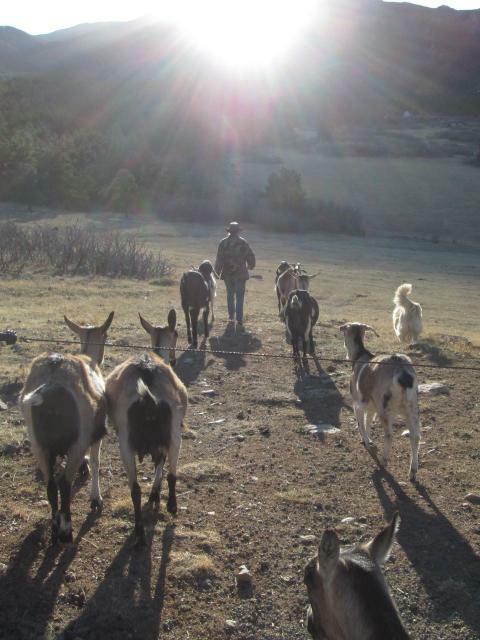 Well-trained goats are such a joy to walk with and I don’t think I realized how good our boys have gotten until that day. Training takes time and progresses in baby steps. 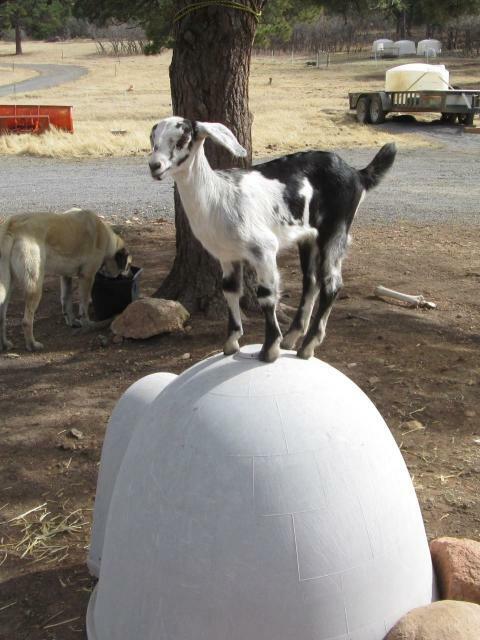 Sometimes it’s hard to see those small improvements until one day you suddenly realize how good your goats are–that they finally feel like they’ve “arrived”. Cuzco had good leash manners and I sometimes lamented that Finn and Sputnik were a lot of work compared to good old Cuzco. 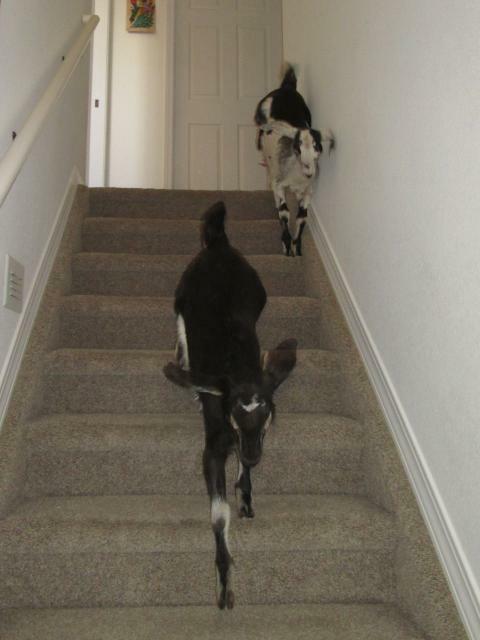 Now Finn and Sputnik are better behaved than Cuzco was! 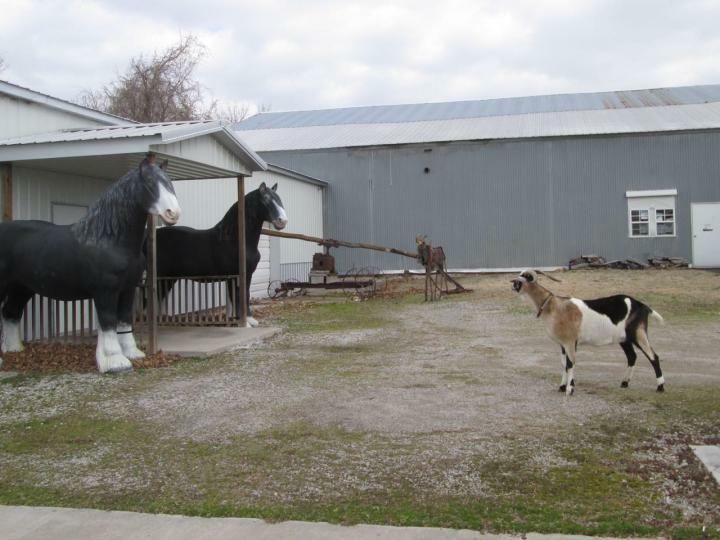 On Monday we stopped at Frontier Equestrian in Jasper, MO. What is Finn staring at? Whoa! 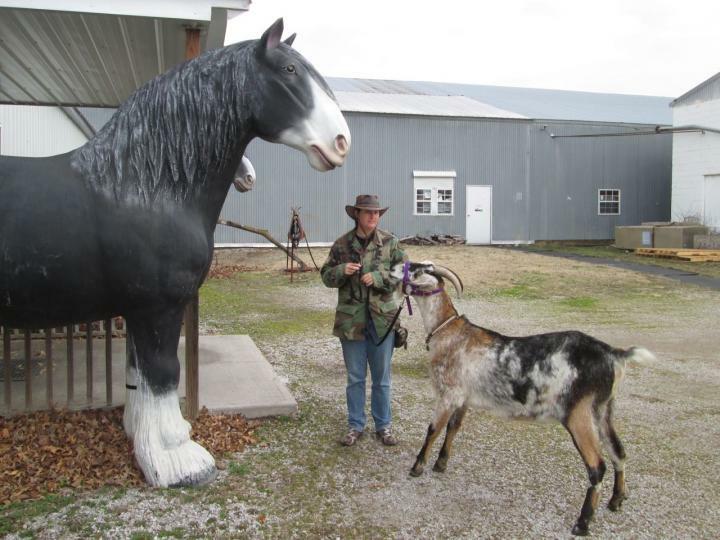 Two life-size Shire horse statues stood guarding the store entrance and Finn was rather terrified of them. They horses seemed a bit suspicious of him too. The store didn’t open until 11:00 so Phil and I had almost two hours to burn. Jasper is a small town that appears to be slowly dying. 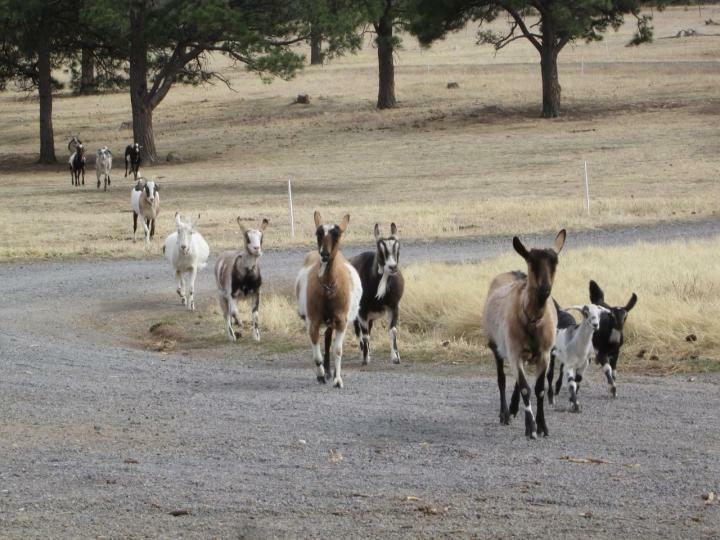 There was no one on the roads so we walked up and down the streets with our goats off-leash. 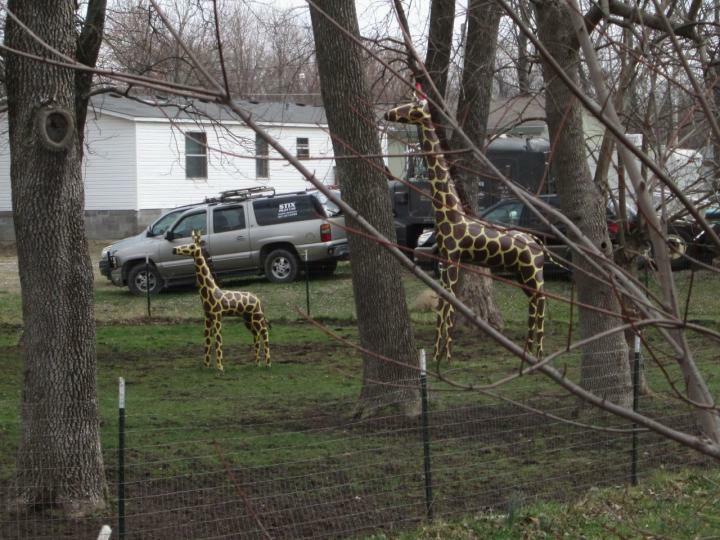 Some people keep giraffes in their yard instead of goats. 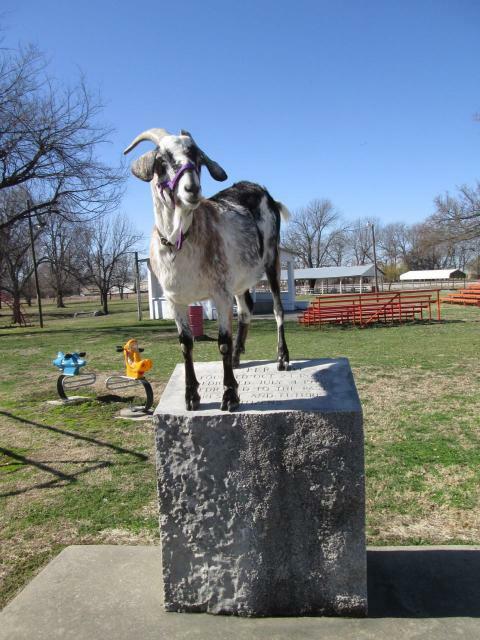 I think this Jasper monument is enhanced by the addition of a large, noble goat. 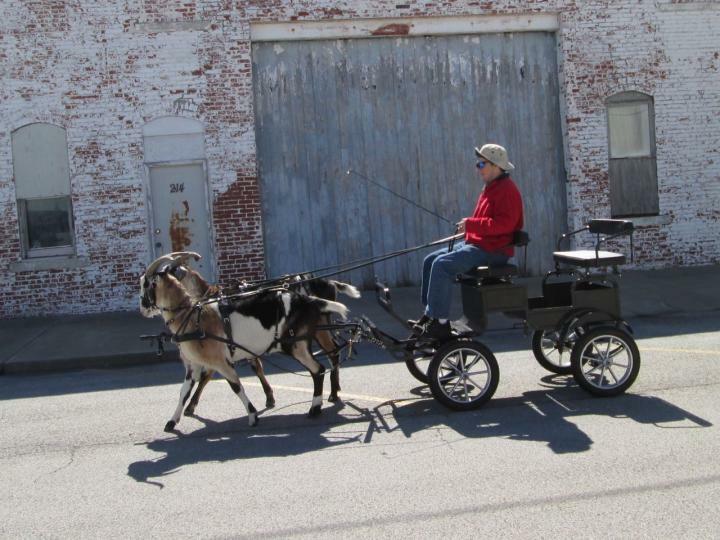 When the carriage shop finally opened we test drove several models. 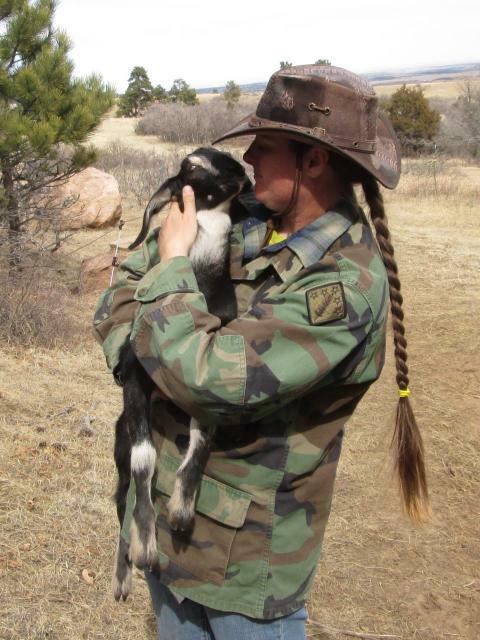 This one was lighter weight but it just didn’t cut it. Too low for one thing, and it had no suspension for another. There was also something not quite right with the team pole and doubletree. We decided to pass. We settled on this two-seater. 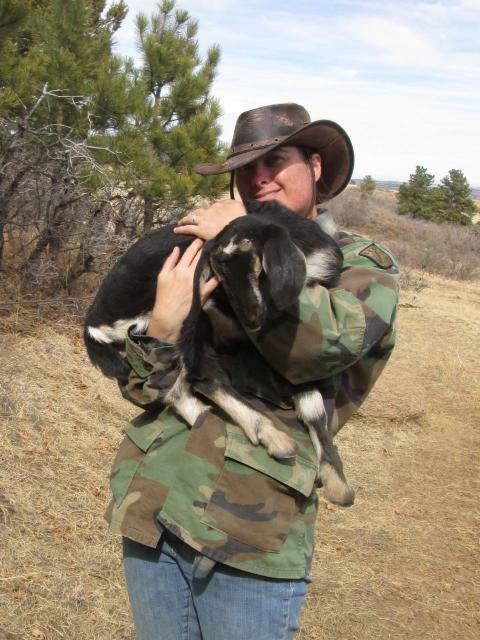 After we tried it with two goats, I hitched up Sputnik to see if he could manage it by himself. He had no trouble working up a good trot. 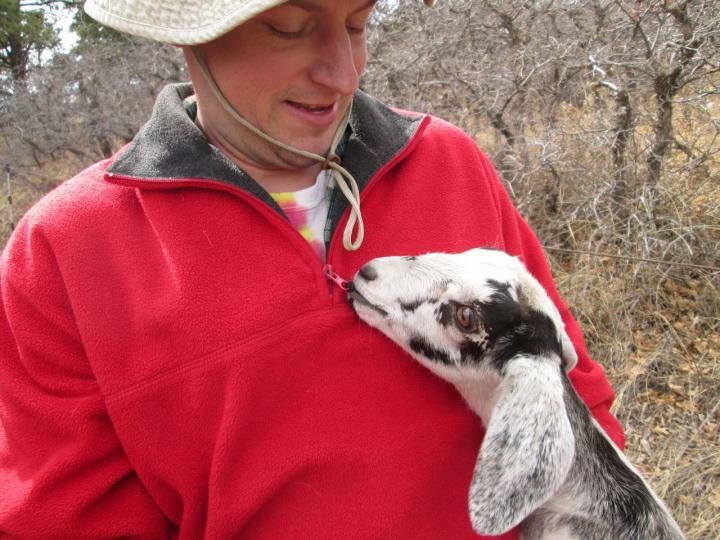 I need to shorten the shafts a bit, but they’re the perfect width and height for a goat. 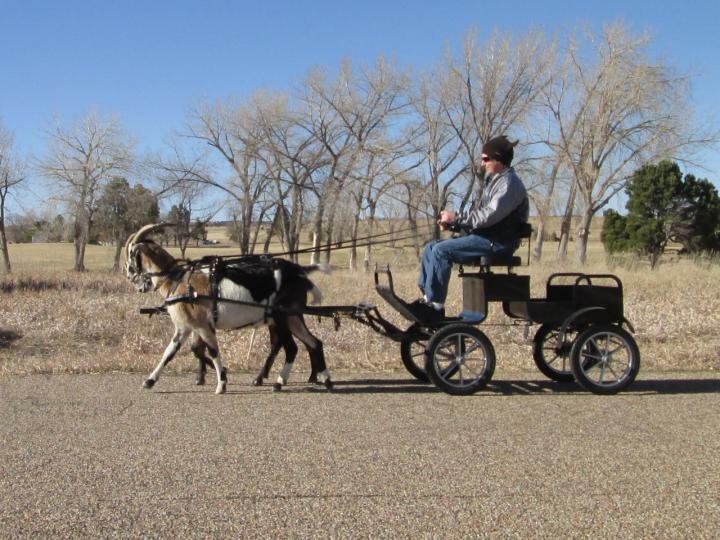 This carriage has good suspension and is a very smooth ride. I can’t wait to try it out next weekend! I have to make a yoke for it first. I think we’re really going to enjoy this little wagon! 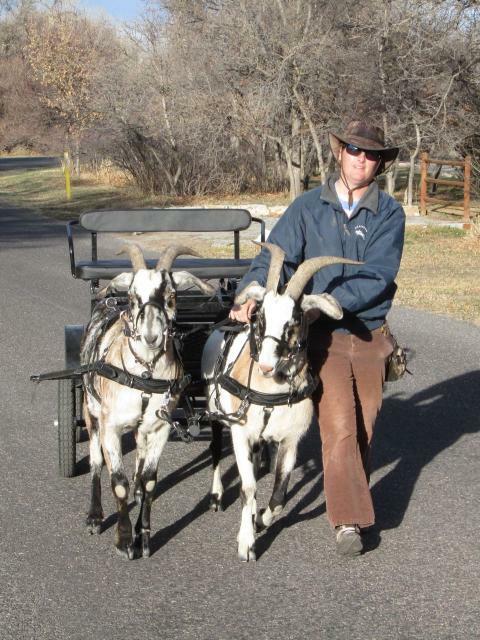 It would even look good with a four-in-hand should we ever have enough goats. We took the boys shopping over the weekend. Here’s a sneak peek at what we brought home!